This mission was part of the Japanese contribution to the International Magnetospheric Study, and it carried out coordinated observations with Exos A (Kyokko). Investigations of correlated mechanisms between particles and fields and plasma turbulence were made with in situ measurement techniques using electrostatic particle analyzers. 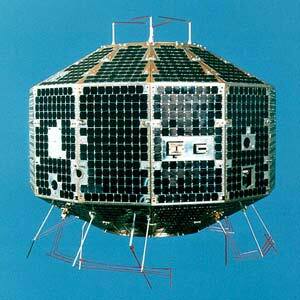 The spacecraft, a 12-sided polyhedron, carried extendable dipole antennas with lengths of 103 m and 69.6 m, and a 1-m boom for a vector magnetometer. A solar panel array provided 30 W into a battery and regulator system. The spacecraft spin stabilized at 150 rpm but dropped to 3 rpm when the two sets of antennas were extended. Attitude was measured with a sun sensor to an accuracy of 0.5 deg. A 0.5 W136 MHz PCM/PM telemetry system handled 256 or 1024 bps, and a 2 W400 MHz PM system handled wideband 10 kHz or 3 kHz data. Data acquisition was in real time except for a 10-Kbyte memory for housekeeping and plasma parameter data. Exos B operated until 1985 and reentered in April 2018.